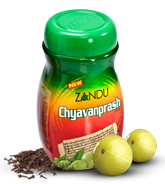 Buy Zandu Chyavanprash for Nutritive, General Debility, Cough, Hoarsness of voice, Debility of Old Age. It comprises health enhancing herbs build prevent aging. Rich in anti-oxidants it contains the goodness of Ghee enhances the medicinal properties of the herbs. The fruit of P. Embilca is given to ally the effects of aging and to restore the organs. In an ayurvedic medicine, the fruit juice is given to strengthen the panoreas of diabetes. The juice is also given to treat eye problem, joint pain and diarrohoea and dysentry. P.Emblica is a Rasayan. A regular usage confers longevity and weight gain. It improves blood picture. The fruit is a rich source of vitamin C. It features in a 7th century Ayurvedic Medical text. The sage Muni Chyavan reputedly restored his vitality with this fruit. Diuretic, Antacid, Laxative, Diaphoratic and Tonic. It contains large quantity of Vitamin C content in Amalak. 5 to 20 gms to be taken twice a day with milk.